This is a quiet, wooded place. There are no homes here, no driveways, no mechanical noises. A thick canopy of century-old oaks and maples shades the afternoon sun to a gentle twilight. A graceful young doe noses through the soft dirt, searching for acorns, her fawns nervous and unsteady beside her. There is a road, barely two lanes, rounded on the shoulders, descending hundreds of feet in just a few miles, ragged with neglect. It cuts through a forest that has long since rejoined and blocked the sky above it. Popping over a crest with a stutter-squeal of the ABS, a white M235i lands and settles in the road's trough, throttling down the long, gently curved descent to the next blind corner. Hot on its heels is another white car, this one with a chrome pony striding across its grille, the rear wheels stepping out briefly over the crest before the fastback flings into the wooded tunnel ahead. The trio of deer remains still as the train of cars hammers through. A Challenger Hellcat rips by, seemingly as big as its Grumman namesake, blowing the early leaves off the road with a rasp and a supercharged Klaxon whine that trails away, leaving the forest silent. You can hear the 9000-rpm roar of the Ferrari 458 Speciale long before you see it. Then it appears all at once, LED marker lights haloed in the Hellcat's dust, whomp into the trough then whaaaaaaaaaa click whaaaaa and the deer flee into the safety of the woods and the trees echo in Dolby Surround and miles away a park ranger swivels his head and without a flash of brake lights the 458 changes direction as if Alonso himself were at the wheel and the aftereffect of the noise is like that scene in Inception where the whole landscape folds over itself and then it's as gone as it was here. Welcome to Performance Car of the Year. The rules of the game are simple: To be eligible, a car must be new for this year or feature significant functional changes. An example of the former: Alfa Romeo's 4C, arriving on these shores for the first time. An example of the latter: the you-can-call-it-a-Dodge-again Viper SRT TA, with a revised aero package and engine tuning. Cars that do not meet either criterion are not welcome, not even if it is last year's winner, the 2014 Corvette Z51. There's no champion's provisional. Fourteen cars were invited to our challenge, ranging from the $34,005 sensible-shoes Volkswagen GTI to the $336,120 Ferrari 458 Speciale. Every one of them someone's dream car, every one outstanding in at least one empirical measure, every one special and exciting to drive. But that isn't enough to win PCOTY. That's just your buy-in. To win, a car has to deliver on every level. It has to shine on the road and shimmer around the Motown Mile, R&T's private airport test track. It has to flatter the novice driver while challenging the experienced racer. It has to offer value for money, regardless of the MSRP. Most of all, however, the PCOTY winner has to be the look-back car. The car you want to drive again, even with 13 other brilliant automobiles surrounding it. The one that you truly want, the one you'd go into debt for. In other words, the one. And like the man said, there can be only one. So let's go. Last year, only the six top PCOTY contenders earned a trip to our road-test loop in the leafy crucible of Ohio's Hocking Hills. This year, we started the proceedings here, in recognition of the fact that our readers spend most of their time without magnetic numbers on their doors. And hey, the magazine's called Road & Track, not Track & Paddock. Though we have Art Director Matt Tierney and snapper Marc Urbano in a Grand Cherokee for logistical support, there's not enough room in the Jeep for all the preconceptions we've brought with us. When lunch formally ends, there's a bit of a Le Mans-style running start for cars that everyone expects to shine on the 1000-foot climb to the Cantwell Cliffs and beyond. No surprise that the M235i has a few people tugging on the door handle. "Great pull, even in the lower rev range … this is the appropriate-size BMW. I'm glad it exists," says Road Test Editor Robin Warner, and later, at dinner, that statement gets a universal nod of the heads. Over the off-camber hills and dips, the Bimmer steps its tail out in thrilling but controllable fashion. On that long, tree-canopied downhill run, however, the M235i feels short on brakes, and I get the distinct feeling that there's a bit too much dignity, too much ball-bearing smoothness, to make this a true successor to the raucous 135i. Web Editor Alex Kierstein agrees. "Good mechanical grip. No drama … sadly, no drama." From the M235i, I jump into the M3. If, as some pundits charge, the M3's become a German answer to the Pontiac Trans Am, this is surely Munich's take on the rip-snorting, 400-cube, screaming-chicken variant used by the Bandit almost 40 years ago. It's a muscle car par excellence, warping the trees around its head-up display with what feels like an unlimited reserve of force. But is it too quick? Senior Editor Jason Cammisa thinks so. "This car is nauseatingly fast. It's also unacceptably traction-compromised. Reducing torque output by 150 lb-ft would do wonders here." He might be right. This car requires rheostat-precise use of the throttle to avoid unpredictable yaw. Or you can just leave the BMW's electronic nannies on, which might be smarter. Two or three generations ago, the M3 gave up on the idea of being the perfect modern 2002tii and decided instead to focus on power and track pace. If that's what you want, it's all here. When Executive Editor Sam Smith pulls up in the Ford Mustang GT, he's grinning like the canary-swallowing cat. "I don't want to say anything, don't want to influence you, but—" Hush, Smith! Let me try it for myself. Okay, the 32-valve Coyote V-8 is as brilliant as it ever was, but when the road starts twisting and falling beneath the Mustang's wheels, the car reveals a depth of competence and personality its predecessors didn't know was possible. The damping: brilliant, letting the chassis move in a way that rewards and demonstrates enthusiasm without ever getting out of hand. The steering feel: leagues better than what pony cars traditionally have, capable of communicating minute differences in available grip without kickback or grittiness. It's BMW steering, the kind you don't get in a BMW anymore. Even the brakes are reasonable, halting the GT without much drama or pedal fade. All the parts here are good, and their sum is even better. The Ford shrinks around the driver at speed. But not everyone is convinced. "Big, bouncy, truckish gearbox," says Senior Editor Josh Condon. "Feels like the old one," Editor-in-Chief Larry Webster notes, in a way that indicates it's not a compliment. Stepping into—well, falling into—the low-slung Alfa Romeo 4C after the Mustang shows that there's at least one properly sized sporting car for sale in the United States. On layout, weight, and simplicity alone, the Alfa makes fast friends. But Smith and I both wonder if the execution isn't as pure or as brilliant as the concept. Still, it's the only one here without power steering. Isn't that worth something? Cammisa's not concerned with quibbles like that: "The 4C is the only car here not pretending to be anything but what it is: a sports car. A stunningly beautiful, bare-bones, fast car. A clutch pedal short of being the best mid-engine sports car in the world—it's a Little Tikes Ferrari 458." To test this theory, I drive the Alfa back-to-back with the Ferrari 458 Speciale—and damn it, Cammisa's not entirely wrong. The problem is that the 4C's chassis is hamstrung by an engine and transmission that seem determined to be in the wrong gear and the wrong part of the boost curve as often as possible. Beautiful and just as responsive as you could want, the Alfa feels weak-hearted. That is not an accusation that anyone will ever level against the Ferrari. Every superlative you've ever read about a road-car engine is rendered trivial by this 597-hp tornado, the world-record holder for specific output in a naturally aspirated roadgoing vehicle, and approximately as subtle as a shotgun blast to the solar plexus. Not a fraction of potential power is wasted on things like flywheel weight or noise reduction. To sit in the Speciale is to be under the thrall of a roar that numbs your ears and vibrates every tendon in your body to a painful pitch. But the pace. My God, the pace. We find an empty, newly paved road that ends in a gravel pit. A road to nowhere, difficult and slippery, without a single sign to warn of the right-angle turns after each blind hill—and the 458 simply monsters it. With the wheel-mounted manettino set to Race, the exhaust becomes virtually transparent and the time in each gear dwindles to the space of a breath. With each flick of the annoying, column-mounted paddles, the Speciale spins the tires briefly, then widescreens the landscape into a blur. You're sitting over the front axle, there's nothing between you and the experience. No matter what it costs, it's value for money, because until now you'd have needed a race-prepped Berlinetta Boxer to get this kind of high-speed Italian drama. I'm still shaking when I return to the rendezvous point, just in time to interrupt a discussion about the Dodge Hellcat. "Pure, classic muscle-car schlock," argues Kierstein, and there's a lot of nodding. This is the car that feels most boulevard-bound, most out of place in the 15-mph corners. Yet there's universal admiration for the power and the brakes. Get out of the corner, straighten the wheel, and nothing satisfies like the Hellcat. "Sadly," Cammisa notes, "it's geared like so many other 600-plus-horsepower, rear-drive cars, which means the 0–60 run is accomplished in first gear, and you'll hit 89 mph in second." The verdict: a guilty pleasure, but a pleasure nonetheless. Driving the Hellcat makes the Chevrolet Camaro Z/28 feel a bit underpowered. Welcome to 2014, where 505 hp doesn't raise any eyebrows. Past tests have told us the Camaro will do the business on the track, but here in the hills, it has few friends. "Feels like I'm driving an SCCA GT1 car out here," Webster gripes, and Smith agrees: "It seems a million miles wide." Yet when I ask it to handle the toughest challenge these roads offer—two off-camber, first-gear near-hairpins connected by a pine-needle-strewn straight—the Z/28 responds with controllable, inch-perfect aplomb. Don't count it out. The un-American takes on the pony-car formula, the Jaguar F-type R Coupe and the Lexus RC F, should attract the same customer in a similar fashion. Surprisingly, not a single staffer fails to articulate a distinct favorite between the two. On Team Lexus: Kierstein, Webster, and a few others. The interior's laser-cut precision, the undeniable caviar quality of the engine's broad powerband, and the rather astounding ability of the suspension to provide magic-carpet ride and max-g grip in a single package. For others, including myself, the F-type takes it. There's just so much power, so much adjustability at speed ("The rear's on casters!" Cammisa laughs), and did I mention the power? "Sounds so good I felt guilty," Senior Editor John Krewson admits. "I love this car … in small increments,"RoadandTrack.com Editorial Director Alex Núñez says. Like the E-types of old, this is fast and thrilling and a certain kind of unsophisticated. What you want from a Jag and no more. But when I give the R Coupe full throttle over a series of whoops and increasing-radius turns, it's positively Supermarine, just like the roadster we had in last year's PCOTY testing. But more, and better, and Team Lexus can go to hell. You have to respect the fact that Jaguar didn't compromise on the looks or the power or the expert-level dynamics. Let's be stereotypical for a moment: This is what people once called a man's car, but it's also hugely attractive to women. The STI and GTI are the most unlikely of fellow travelers, but time has blunted the Subaru's 305-hp muscle with size and weight, even as the GTI has been cutting pounds and adding seemingly underrated horsepower. When Smith and I take the pair for a quick run up and down the "staircase" on Route 374, we expect the sedan to walk the hatch, and it does. But not by much. The Subaru remains a hell of a lot of fun. "I got out of this wearing a Keanu Reeves whoa-face," says Condon. "Steering feel is great," Warner gushes, and I agree. No longer fast by modern standards, the STI remains satisfying. The GTI, on the other hand … "Without a second's hesitation, this is the car in this group that each of us would buy with our own money," Cammisa says. In an assemblage of cars costing up to nine times its MSRP, the VW impresses in every respect, from interior quality to the idiot-proof, lift-throttle yaw control that's available at speeds from mild to felonious. No other car here gives you as much confidence approaching an unknown corner; no other car has this kind of broad zone between the onset of tire squeal and the fear of impending doom. You can push it. Hard. Which leaves just the trio of not-quite-supercars for our consideration. First up: the Nissan GT-R Nismo. There simply isn't a faster way to cover unfamiliar pavement, and although you'll pay twice the retail of the original R35 for this ridiculously striped variant, the juice is worth the squeeze. You can't fluster this car. The minute you can see the exit of a turn, simply floor the throttle; the Nissan will do the math and take care of the rest, leaving even the Ferrari gasping for air behind it. Later, at dinner, I'll ask the group which car covers the most real-world ground in the least amount of time, and the vote will be unanimous: Nissan. The Viper, by contrast, feels like a chore to many. "Sounds like a dump truck," chuckles Núñez, before conceding that "this is going to be the balls on the track." "Nothing about this car appeals to me but the speed," complains Associate Editor Max Prince. But Smith ("Jittery, trucklike war cannon that I can't like … why do I love it so much?") and Webster ("No right being as good as it is") at least respect it. As for me, I've loved the Viper as both a track and street proposition for years, and when I manage to put this one four wheels in the air at a truly indecent speed, smacking the nose hard enough on landing to toss my notebook into the cargo area, yet without losing a fraction of pace or momentum, my affection remains as strong as ever. If we voted right now, without the cruel concrete of the Motown Mile to expose on-limit behavior and trivialize power curves the way a track always does? The Alfa's got a lot of fans, as does the Mustang. The Ferrari is too fast for even the fastest roads. There are whispers that the GTI might take the prize, if only it retains its charm around the Mile's blue landing lights. Whatever. Talk is cheap. Track time is money. Time to head north. THE MOTOWN MILE: Road & Track's private airport track is rough and tumble by design. While mostly flat, the surface is littered with bumps, transitions, and nearly invisible camber changes that turn usually stable cars into sliding handfuls. We use the lap time and the impressions gleaned from obtaining it to present you with a clearer picture of the modern performance car. A machine quick on the Mile is a track weapon, but also adaptable, confidence-inspiring, and swift in the real world. Fall in Michigan means the weather is anything but predictable. Over the next two days, we'll see a 30-degree swing in temperature, a massive storm that sweeps traffic off the road and forces our 14 contenders to huddle behind the cracked windows of an ancient hangar, and the kind of unrelenting sun that makes all but the most dedicated racers present run the A/C on the track. Yet there's still time for everyone to get their laps in. The results of timed lapping don't surprise us: The Ferrari is fastest, followed by the GT-R and GT3. As president of the R&T Viper Fan Club (and a member, too!) I feel compelled to note that the gap between the GT3 and the snake is less than the time required to make one of the Viper's manual shifts. READ MORE: Why do cars look so angry? PCOTY isn't about lap time, though—and why should it be, when even a vintage SCCA sports racer can smoke supercars around a road course? But we need the Motown Mile, to show us what these cars can do in controlled, repeatable, non-pedestrian-endangering conditions. The Alfa should shine here; it's the lightest car in the test and it's not short on tire. But the short straights of the Mile expose weaknesses in powertrains the way Hamlet stabbed Polonius through the curtain, and there's no place for the 4C's awkward transmission to hide. By noon on the first day, the Alfa is mostly sitting idle as drivers gravitate for repeat sessions in more entertaining contenders. Sadly, the Hellcat sits, too. "Feels like I'm in an SUV," Webster grumbles. Yet I take it as a challenge to hold the right pedal down past the Kink on the Mile's front straight. I unwind in a hurry from the back corner, using the throttle to speed the process, and for the next five seconds, I'm just a passenger, a kid riding a Radio Flyer wagon that happens to have a General Electric J79 turbojet tied to the back. This will put hair on your chest. Recommended. A similar experience, albeit with better seats and the excellent Mark Levinson stereo, should be available in the Lexus RC F. Unfortunately, it isn't, thanks to a cowardly stability-control computer that never stops nannying and can't be disengaged. The number of ways in which the Lexus will sabotage your lap is legion. I take a rerun, because I initially can't get the car to shift at redline, permit minor slip angles, and/or play Guns N' Roses without warning me that my feelings were at risk. "It won't do a burnout!" Cammisa moans. It also won't permit any of the tomfoolery for which its IS F predecessor was famous. Thus, Team Lexus loses fans, but does Team Jaguar gain them? "Nice, balanced, effortlessly fast" is Núñez's verdict on the F-type. "I don't get a sports-car vibe. As an owner, I wouldn't track it," replies Kierstein. "You just want to drive like a ridiculous person," Condon says, but what does that mean? Think of the Jag as a speedboat: If you want it to change direction, it needs to be under power. The transmission that is so brilliant on the road feels disconnected and sullen here, the steering is slow, the car won't put down power midcorner in predictable fashion. It's simply not a track car, even in this R form. The Camaro Z/28, of course, puts clear air between itself and the pony cars, foreign or domestic, at the Mile. The Chevy's width doesn't matter here, while its chassis feels authentic and unflappable. So why is there no line to drive it, but the Mustang has people tapping their feet with impatience, waiting for their turn? Part of it's the novelty—this is the first time any of the staff has driven the car on-track—but the rest is true virtue. An early straw poll shows that more of us feel more confident and more accomplished in the Mustang than in any other car. Not so your humble author. For me, it's the Viper and always will be. "It kind of is a big Miata," Núñez admits, echoing something I told him before he took his laps. "Does everything you ask of it." Each input is returned with precise action; everything the car tells you is honest and true. At the limit, the Viper's the most trustworthy of the big-motor players. When this car got variable valve timing, even in its crudest form, it learned to breathe—and that made it thrilling, not just fast. And now that it has the modern electronic leashes available, it's accessible to novices. Within reason, of course. Prince takes a few laps and says, "I can go faster in everything else." It's not everyone's taste, and it can't win this competition, because it doesn't inspire enough confidence in enough of us. But if you speak Viper, this is the best Viper yet, and it rewards at every level. The GT-R is quicker than the Viper, but it relies on corner-exit speed to make up for what its weight costs it in the Mile's rapid-fire chicanes. "The Nismo," Cammisa suggests, "is a stunning example of how good a car can become, dynamically, if its maker hones its tuning year after year." The GT-R gets respect, but in a heated lunchtime conversation, the staff cools on the car, citing the Nissan's bulk, F-350 Super Duty driving position, and interior aesthetic that should have been retired with the 280ZX Turbo. The GT3, on the other hand, is becoming more popular. The charm that requires life-threatening heroics to uncover in the Hocking Hills is surprisingly accessible around the Mile. "Now it feels like a 911," Smith notes. "Stupid easy to drive," Prince says. There's a line for this one, too. I'm not in that line. I'm driving the Ferrari, again and again. The aluminum floor, the badass flat-panel carbon-fiber doors full of handmade imperfections, the steering-wheel shift lights. You could own this car for 30 years and never be bored for a moment. You hear it in your lungs when you ease on the throttle, and it has eyeball-squashing power in a part of the tachometer that's just for decoration on the other cars. All my life, I've waited for Ferraris to be as special as their price tags, and this one is. Yet it's a dream car for middle-aged men. The young man's dream car is sitting next to it, four-doored and big-winged in that oh-so-familiar shade of blue. The people who buy the STI don't care that the competition gets faster every year, because they're going to turn up the boost themselves. (If you don't do that, then you'd better put on your turn signal when some soccer mom wants to 40-roll you in her V-6 Camry.) Still, there's pleasure to be had from noticing the very real effect that the Subaru's adjustable center differential has on cornering behavior. Behind the wheel of the STI, Prince is a bit of a terror, going very quickly. Accessible, intelligent, and still looks like a rally car. For many staffers, the GTI stood in the long shadow of last year's PCOTY podium finisher, the Ford Fiesta ST. For the extra money Volkswagen charges—and that's not a lot—you get so much more refinement, so much more power, such a feel of prestige. What you don't get is the rabid enthusiasm that characterized early GTIs. This is a grown-up car indeed, and stellar on the road. On track, we'd rather have something else. The M3 is the only car to actually scare me at the Motown Mile. Going around the fast final turn, the torque spikes and sends me into a long, lazy, 100-mph slide that I don't recover until well down the front straight. Forget this being a German Trans Am; it's a German Corvette. "This car is nightmarish to control under power," concurs Cammisa. "It's so much work, and there's no joy to be had as a result." Having driven the M3 before, on a larger track, I suggest that it needs a bigger venue to shine. Cammisa agrees. The M235i commits perhaps an opposite fault: It's not vicious enough. Webster comments: "Filtered," and Krewson notes: "Power, sure. Engagement, no." That said, it's the equivalent of an L-39 Albatros for track-day drivers: fast enough to keep up with traffic, comfortable enough for the drive home, with plenty of depth to explore. Two days, hundreds of laps, and more than a few shattered preconceptions. It doesn't come easy, but after a series of arguments that verge on personal and heated, the staff has settled on three favorites. There are truly no losers here. No, wait, scratch that. There are going to be 13 losers. But that doesn't mean that they aren't good cars. There wasn't a single entrant that didn't light someone's fire, even if those affections sometimes proved fickle. And in a few cases, most notably with the STI, Hellcat, and GT-R, the reactions from enthusiast drivers on the street proved that the Ferrari, Porsche, and Alfa didn't have all the star power in our gathering. Still, three cars put clear distance between themselves and the rest of the pack. Let's start with the Ferrari 458 Speciale. PCOTY demands emotional involvement, and the Speciale delivers to an extent we didn't previously believe possible. It was the fastest car we've ever run around the Motown Mile, and on a back road, it's sensual and demanding all at once, like a 19-year-old mistress with a flair for screaming in public. But it was too loud and raw for most of us to take. It attracted cops and angry people in worrisome doses, and it forces its owner to be the center of attention. Driving it is like wearing a multicolored fur top hat and Bootsy Collins sunglasses: It'll definitely get you noticed, probably keep you from going home alone, but you'd better be committed. We also singled out the Mustang GT Coupe Premium. It's okay to believe the hype about this nearly perfected pony. It's not just the best American two-plus-two in history, it's a credible rival to the high-power European competition that sells for two or three times the price. On a back road, it's accessible and thrilling for every level of driver. Like last year's winner, the seventh-generation Corvette, it redefines what's possible at a relatively affordable price. Every sub-$50,000 car on the market will have to answer to the Ford from now on, no matter what badge it brings to the table. The problem, if there is one, is that this Mustang doesn't fully exploit the potential on-track brilliance of the model's new platform. That will come next year, with the flat-crank, harder-than-hard-core GT350. We're expecting great things from that car. But for now, the Mustang remains more "road" than "track." About $400,000 would get you both Ferrari and Ford, assuming you have a solid relationship with your local dealers. You could be assured that you had the best of both worlds, and you'd never be confused as to which car was appropriate at a given time. So here's the brilliance of the Porsche GT3: Most of our staffers thought it was better around the Motown Mile than the Ferrari, and pretty much everybody thought it beat the Mustang six ways to Sunday as a street car. Start with the way it looks: equal parts longhood 901 and Danny Ongais 934, grace and aggression in balance. Open the door, have a seat. You could drive across the country in this car and never feel resentful. There's a concert-quality stereo on the options list and three different seating options to fit your preferences. In the Hocking Hills, the GT3 demonstrated stratospheric cornering and braking limits while still managing to thrill the drivers who didn't reach for those limits. The tactile quality of the steering, the billet solidity of the brakes, the laugh that escapes everyone's lips the first time they run the tach to 9000 rpm on a two-lane: like dark chocolate, complex and satisfying. In Ohio, the Porsche hinted at its raw speed, but around the Mile, it went from flirtatious to furious in the blink of an eye. If you want to drive it at seven-tenths, it will blast by the majority of track-day traffic while keeping you as secure as a child in his bedtime blanket. If you want to switch off the systems and reach for the edge of the tire, it will respond with pace and limits that approach those of an IMSA Cup racer. 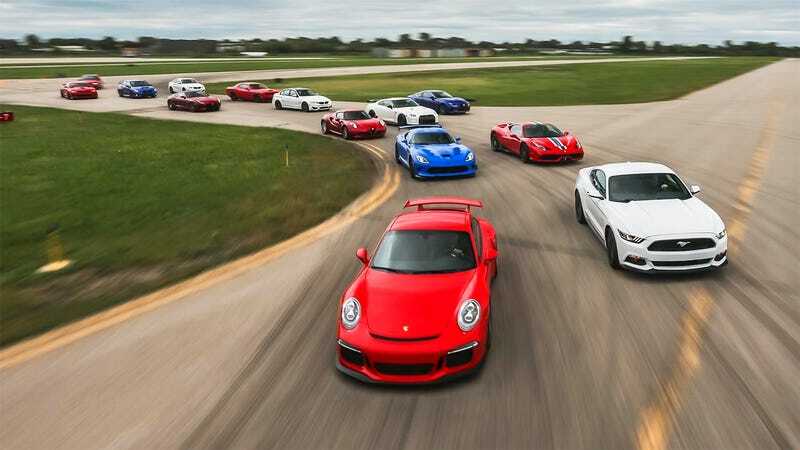 Perhaps the truest measure of the Porsche's brilliance was this: Over the course of two days, I stood and watched 14 different drivers run 14 different cars around the Mile. I expected everybody to get the most out of the GTI, and pretty much everybody did. I expected many of the drivers to have challenges extracting the absolute best from the Viper, and that happened as well. But there was one car that looked and sounded like it was on full boil no matter who was driving. One car that smoked by the starter's flag at full chat whether it was the old-hand racers or the new-blood writers behind the wheel. One car that gave its all, every time, to every driver. Emotion and commotion, sense and sensibility; the Porsche 911 GT3 is the 2015 Performance Car of the Year.